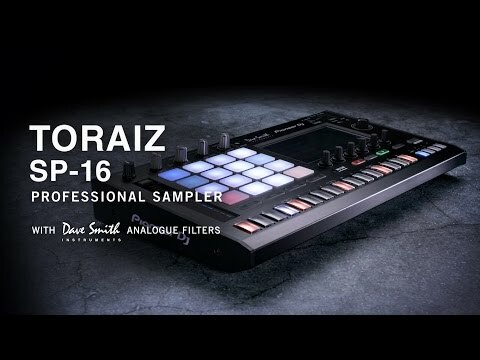 The use of superlatives is an often overused practice when it comes to new product releases, but the Pioneer Toraiz SP-16 Professional Sampler and Step Sequencer is thoroughly deserving of the high praise it has already received. Creating a standalone production tool that bridges the gap between the studio, and the stage. The Toraiz SP-16 has all the hallmarks of Pioneer's industry-standard design, which is solidly built and easy to use. However, this exceptional piece of hardware benefits from their collaboration with legendary synth creator Dave Smith. Features high and low-pass analogue filters that are modelled on those of Smith's Prophet-6 synthesiser, you can infuse your sonic creations with all the rich, analogue warmth and presence you could desire. The Pioneer Toraiz SP-16 is equipped with a 7-inch, full-colour touch display that gives you immediate access to all the sample information you need. Browse, select, and personalise your samples on-the-fly, with additional control available via the rotary knobs below the screen. The built-in 16-step sequencer always you to create up to 256 unique patterns. These patterns can then be saved, with instant loop-playback, and the dials used to modulate your sounds. The backlit buttons reflect colours assigned to each sound to act as a visual guide, enabling you to keep on top of your performance with minimum effort. Next to the touchscreen is a 4 x 4 grid layout of tactile performance pads that allow up to 16 samples to be loaded. Whether you want to create simple to complex rhythm patterns or intricate drum beats, the velocity-sensitive pads respond dutifully to your every move. The "Velocity Mode" enables you to control the sample volume based on the amount of pressure applied to the pad, creating truly realistic percussive performances. Alongside the pads you'll find a touch strip, which can be used for instant control over various sample parameters, such as pitch bending. No matter what you through at the Toraiz SP-16, Pioneer has equipped it with an exceptionally powerful engine that handles everything with ease. Even if you're playing 16 sample simultaneously, and throwing in lots of memory-dependent effects, i.e. time stretch, pitch bend, amp envelope, etc., the Toraiz has you covered. The 8GB of flash memory allows you to use this beauty as a stand-alone unit, without the need for a laptop. Once again, Pioneer has teamed up with the crew at Loopmasters and included 2GB of pre-installed samples that allow you to get performing straight out of the box. The USB connection means that external sound sources can be integrated without any hassle using a USB storage device. As with their industry-standard NEXUS CDJs and mixers, the Toraiz SP-16 is PRO DJ LINK enabled, which enables you to connect to all your other compatible gear and sync one-shots and loops to the beat of the master deck.